Interferon (IFN)-α is considered a key modulator of immunopathological processes through a signature-specific activation of mononuclear phagocytes (MPs). 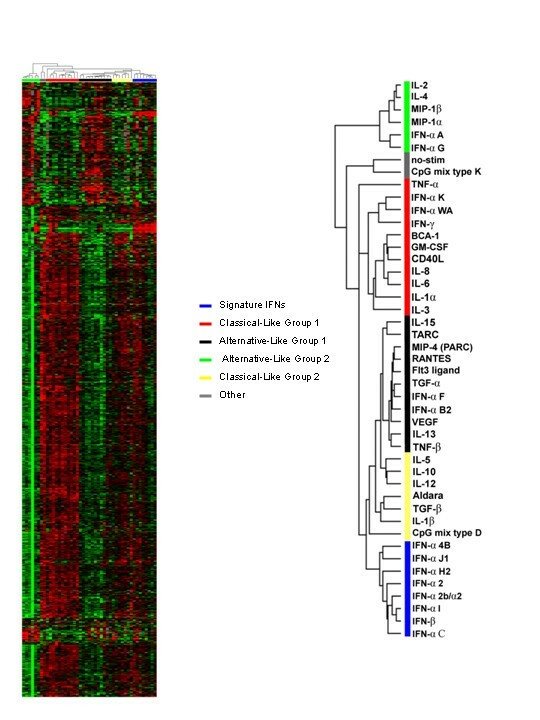 This study utilized global transcript analysis to characterize the effects of the entire type I IFN family in comparison to a broad panel of other cytokines on MP previously exposed to Lipopolysaccharide (LPS) stimulation in vitro. Immature peripheral blood CD14+ MPs were stimulated with LPS and 1 hour later with 42 separate soluble factors including cytokines, chemokines, interleukins, growth factors and IFNs. Gene expression profiling of MPs was analyzed 4 and 9 hours after cytokine stimulation. Four hours after stimulation, the transcriptional analysis of MPs revealed two main classes of cytokines: one associated with the alternative and the other with the classical pathway of MP activation without a clear polarization of type I IFNs effects. In contrast, after 9 hours of stimulation most type I IFN isoforms induced a characteristic and unique transcriptional pattern separate from other cytokines. These "signature" IFNs included; IFN-β, IFN-α2b/α2, IFN-αI, IFN-α2, IFN-αC, IFN-αJ1, IFN-αH2, and INF-α4B and induced the over-expression of 44 genes, all of which had known functional relationships with IFN such as myxovirus resistance (Mx)-1, Mx-2, and interferon-induced hepatitis C-associated microtubular aggregation protein. A second group of type I IFNs segregated separately and in closer association with the type II IFN-γ. The phylogenetic relationship of amino acid sequences among type I IFNs did not explain their sub-classification, although differences at positions 94 through 109 and 175 through 189 were present between the signature and other IFNs. Seven IFN-α isoforms and IFN-β participate in the late phase polarization of MPs conditioned by LPS. 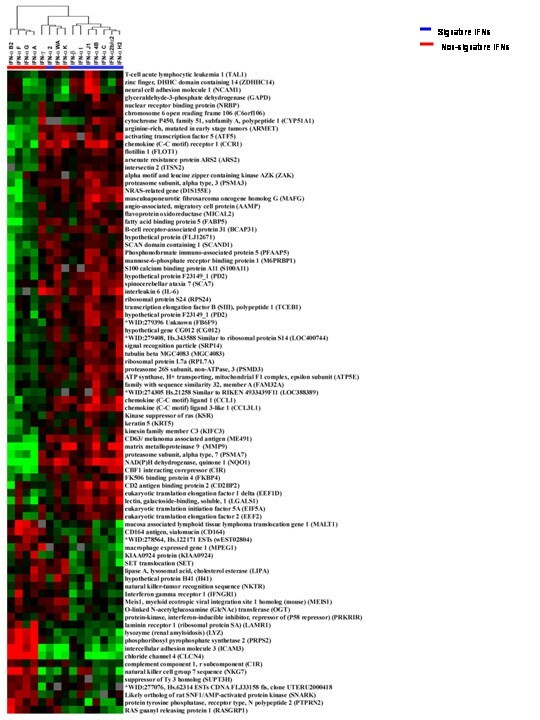 This information broadens the previous view of the central role played by IFN-α in autoimmunity and tumor rejection by including and/or excluding an array of related factors likely to be heterogeneously expressed by distinct sub-populations of individuals in sickness or in response to biological therapy. It has been proposed recently that autoimmunity or, more generally, immunity is driven by a dynamic system balancing opposite vectors represented by type one interferons (IFNs) in one direction and tumor necrosis factor (TNF) in the other . This dichotomy is mediated through divergent activation of mononuclear phagocytes (MPs) by the two cytokine families resulting in specific signatures of gene expression that are characteristic of distinct autoimmune pathologies such as systemic lupus erythematosus (SLE, IFN-α/β) or rheumatoid arthritis (TNF) [1–3]. Interestingly, although type I IFN signatures are consistently observed in patients with SLE, only a fraction of them demonstrate elevated IFN serum protein levels . Therefore, it is possible that testing methods may not detect all the IFN species that might circulate in the blood and which may yield similar biological effects. For this reason, we evaluated the effect of a panel of related type I IFN molecules in modulating the transcriptional profile of MPs exposed to lipopolysacaride (LPS) according to a previously described experimental model . The molecular signatures of type I IFNs were compared with those of IFN-γ, TNF-α and TNF-β as well as a comprehensive panel of other cytokines to characterize the specificity of IFN polarization of MPs in the context of an extended cytokine network. Indeed, MPs play a critical role in acute and chronic inflammation performing diverse functions in different stages of activation. MPs recruit and activate immune effector cells or they may down-regulate the inflammatory process to contain collateral damage . Pro-inflammatory MPs, known as type 1 or M1 MPs, function as true antigen presenting cells that recruit and activate immune effector cells [6, 7]. MP that enhance tissue repair, stimulate angiogenesis, and contain collateral damage through reduced inflammation are known as type 2, or M2 MPs [8, 9]. Type 2 mononuclear phagocytes can be further categorized as M2 a, b, c  suggesting a continuous spectrum of MP activation. Many factors may influence the differentiation of immature MPs toward a polarized M1 or M2 phenotype along the classical or the alternative pathway of transcriptional activation . Theoretically, the in vivo functional phenotype of MPs along each of these pathways is dependent on the environment, since foreign products (microbial products) and endogenous cytokines modulate their activation and maturation . MPs are capable of tailoring their response to specific microbes and microbial products as demonstrated by the display of a distinct gene expression profile upon stimulation with different pathogen products . The effects of different cytokines and other bioactive soluble factors on MPs are also variable. Stimulation of MPs with interferon-γ (IFN-γ) alone or with lipopolysacaride (LPS) plus IFN-γ, CD40L, and Flt-3 ligand (FLT3-L) yields M1 MPs. Treatment of MPs with IL-4 and IL-13 induces a M2 MP phentotype. Changes in MPs following microbial stimulation do not occur as a single event over a brief period of time but in waves each lasting several hours. A comparison of MPs stimulated with 3 different microbes, E. coli, C. albicans and influenza found that gene expression was most rapidly induced by E. coli and most slowly by influenza. The gene expression profiles induced by these three microbes continued to change for more than 24 hours . We have found that cytokines have a marked affect on LPS-stimulated MPs . Immature CD14+ peripheral blood MPs were stimulated with LPS and one hour later they were treated separately with 42 different cytokines. After 4 hours, the MPs were analyzed by gene expression profiling using a 17 K cDNA chip. LPS-stimulation alone induced a gene expression profile typical of the classical pathway of MP activation, but which was markedly altered by additional cytokine stimulation. 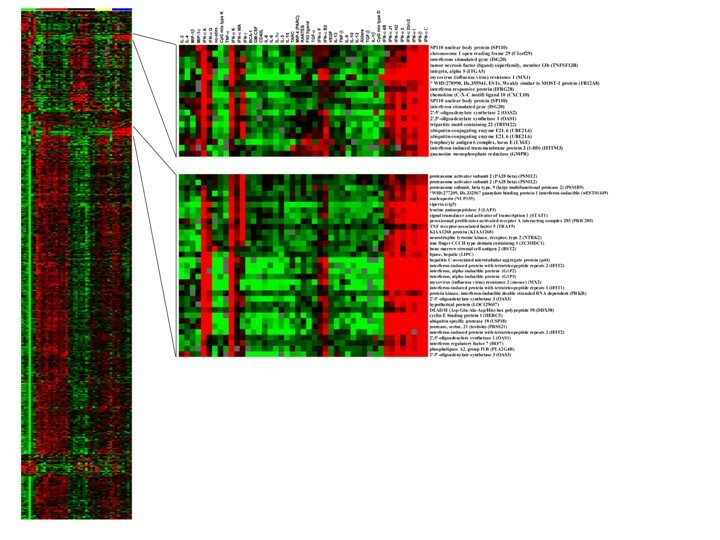 Hierarchical clustering of gene expression profiles of LPS-stimulated MPs treated with 42 factors for four hours revealed two main groups of cytokines. One group included IL-4, IL-13, TGF-α, TGF-β, and VEGF and represented the alternative pathway of MP activation. A second group included IFN-β, IFN-γ, CD40L, and FLT-3L generally associated with the classical pathway. Some cytokines such as IL-10, IL-1β, IL-15, IFN-αA and IFN-α2b did not separate into either of the two classes . Interestingly, 4 hours after cytokine exposure, type I IFNs did not display similarities in MP transcriptional activation among themselves. Instead, the various IFN family members were scattered among the different cytokine sub classifications. This finding suggested that IFN polarization of MP activation following LPS exposure is a delayed event. In this study, therefore, we present the gene profiling of LPS-conditioned MPs 9 hours after exposure to 42 different cytokines as previously reported for the 4 hour time point . Prolonged exposure (9 hours) to these bioactive factors revealed a unique polarization of MP maturation induced by most (but not all) members of the type I IFN family and singled out this group of factors for its ability to induce a distinctive MP gene expression profile. Peripheral blood mononuclear cells (PBMC) from an HLA-A*0201 positive healthy Caucasian male donor age 35 were collected by lymph apheresis at the Department of Transfusion Medicine, NIH. PBMC were isolated by Ficoll gradient separation and frozen until analysis. After thawing, PBMC were kept overnight in 175 cm2 tissue culture flasks (Costar, Cambridge, MA) in complete medium (CM) consisting of Iscove's medium (Biofluids, Rockville, MD) supplemented with 10% heat-inactivated human AB-serum (Gemini Bioproducts, Inc, Calabasas, CA), 10 mM hepes buffer (Cellgro, Mediatech, Inc. Herndon, VA), 0.03% L-glutamine (Biofluids), 100 U/ml Penicillin/Streptomycin (Biofluids), 10 μg/ml Ciprofloxacin (Bayer, West Haven, CT), and 0.5 mg/ml amphotericin B (Biofluids). Adherent and non-adherent cells were gently removed from the flask and centrifugated. MP were separated by negative selection using the MP isolation kit and an autoMACS system (both Miltenyi, Bergisch Gladbach, Germany). Before and after separation cells were stained with anti-CD14-FITC (Becton Dickinson, San Diego, CA), and analyzed using a FACScalibur flow cytometer and CellQuest software (Becton Dickinson). Negatively selected CD14+ cells were washed twice with serum free OPTI-MEM (OM) medium (GIBCO BRL) prepared similarly to CM. The final cell population which contained > 90% CD14+ cells was then seeded at the concentration of 1 × 106 / ml in 10 ml OM in 25 cm2 flasks (Falcon, Franklin Lakes, NJ) and stimulated with 5 μg/ml LPS (SIGMA St. Louis, MO) for one hour. No LPS was added to the non-stimulation control flask. After one hour, 42 cytokines, chemokines and soluble factors were added individually to the MP suspensions (IL-1α, IFN-αC, IFN-αJ1, IL-13, IFN-α4B, MIP-1β, IFN-αG, IL-12, IL-5, IL-4, VEGF, TGFβ, IL-8, IFN-α1, MIP-4 (Parc), Rantes, IFN-αWA, TGFα, IFN-γ, IFN-α2, BCA-1, IFN-αF2, IL-2, Flt-3 Ligand, MIP 1α, IFN-αK, IL-6, IFN-β, IFN-αH2, IFN-αβ2, CD40L, IL-3, Tarc, TNF-α, IFN-α2b, IL-10, Aldara, IL-1 IL-15, IFN- A, TNF- GM-CSF) . Nine hours after LPS stimulation, MP were harvested, washed twice in PBS, and lysed for RNA isolation using 700 μl RNeasy lysis buffer per 25 cm2 flask, according to the manufacturer's protocol. Total RNA was isolated using RNeasy minikits (Qiagen). Amplified antisense RNA (aRNA) was prepared from total RNA (0.5–3 μg) according the protocol previously described by us [12, 13]. Test samples were labeled with Cy5-dUTP (Amersham, Piscataway, NJ) while the reference sample (pooled normal donor PBMC) was labeled with Cy3-dUTP. Test-reference sample pairs were mixed and co-hybridized to 17 K-cDNA microarrays. Hybridized arrays were scanned at 10-μm resolution on a GenePix 4000 scanner (Axon Instruments, Union City, CA) at variable PMT voltage to obtain maximal signal intensities with < 1% probe saturation. Resulting tiff images were analyzed via ArraySuite software (National Human Genome Research Institute, Bethesda, MD). Data were further analyzed using Cluster and Tree View software  and Partek Pro software (Partek Inc., St Charles, MO). The global gene expression profiling of 9 hour treated and untreated MP consisted of 49 experimental samples. Subsequent low stringency filtering (80% gene presence across all experiments and removal of genes that did not have at least in 1 of the samples a Log2 = 2; 4 ratio) selected 2,063 genes for further analysis. Clustering of experimental samples according to Eisen et al. was based on these genes. Gene ratios were average corrected across experimental samples and displayed according to the central method for display using a normalization factor as recommended by Ross . We have previously shown that the transcriptional profile of MPs stimulated by LPS and subjected for 4 hours to distinct cytokine stimulation can be polarized into two major subgroups and an third intermediate subgroup according to the type of cytokine used in culture . IFN-γ stimulation induced transcriptional changes that are consistent with its pro-inflammatory activity and with the type I pathway of MP activation . After 4 hours type I IFNs demonstrated a variety of individual transcriptional profiles and no type I IFN-specific signatures could be identified. On the contrary, in the present analysis, we observed that 9 hours after stimulation a number of type I IFNs congregated within a single cluster that was characterized by molecular signatures unique to these cytokines and was responsible for a unique MP polarization response. This pattern of IFN-induced polarization was identified as follows: unsupervised hierarchical clustering analysis was applied to the global data set of MPs treated separately with 42 cytokines for 9 hours after LPS stimulation. The data set was filtered to sort genes that were expressed in at least 80% of samples and whose expression was increased 3 or more fold in at least one sample. Filtering yielded 2,063 genes that would be most informative among the 17 K gene pool. Cytokine treatments segregated into five groups (Figure 1). One group included cytokines best classified as those that act through the classical pathway of MP activation such as IFN-γ, TNF-α, IL-3, IL-6, GM-CSF, and CD40L (Red bar, Figure 1). These cytokines were similarly classified in our previous analysis at the 4 hour time point . Since most though not all the cytokines in this group are recognized to act through the classical pathway of MP activation, this group was referred to as the "classical-like" group. Interestingly, this group included not only the type II IFN-γ but other type I IFNs such as IFN-αK and IFN-αWA. This observation suggested that these type I IFNs have similarities in the transcriptional activation of MPs with type II IFNs. Another cluster included cytokines that are characteristically included in the alternative pathway of MP activation such as IL-13, VEGF and TGF-α and it was referred to as the "alternative-like" group 1 (Black bar, Figure 1). On visual inspection this group displays a transcriptional profile opposite to the classical group. This group also included type I IFNs such as IFN-αB2 and IFN-αF or IFN-α21). A third group contained several cytokines that also activate MPs via the alternative pathway including IL-4, MIP-1α, and MIP-1β and was referred to as alternative-like group 2(Green bar, Figure 1). This group was most distant in transcriptional profile from all other groups and was separated from them by the transcriptional profile of MPs stimulated with oligonucleotides containing a unmethylated deoxycytosine-deoxyguanosine (CpG) motifs mixture (CpG mix type K) (Grey bar, Figure 1) or had not been exposed to any soluble factors and, therefore, was representative of the transcriptional profile of MPs in culture. Thus, this group most likely represented the most divergent example of alternative MP activation 9 hours after stimulation. However, even on visual inspection, the alternative-like group 2 displays a transcriptional pattern similar to the alternative-like group 1 with most genes co-coordinately expressed between them (Figure 1). Unsupervised clustering of LPS-stimulated CD14+ MP exposed to distinct cytokine treatments. CD14+ MP were stimulated in parallel with LPS and exposed after 1 hour to 42 individual cytokines. Antisense RNA obtained 9 hours following LPS stimulation, was hybridized to custom made 17 k cDNA arrays. Unsupervised Eisen  clustering was applied to the complete, unfiltered data set of 98 experiments. A375 is a melanoma cell line that was used for quality control alternating conventional (Cy5, red) or reciprocal (Cy3, green) labeling every 25 experiments as previously described . A total of 2063 genes were analyzed. These genes were obtained by filtering the 16,000 genes and analyzing only those present in greater than 80% of samples and with at least one observation greater than 2 logs. The expression of each gene was average corrected among the cytokines. /α2, IFN-αI, IFN-α2, IFN-αC, IFN-αJ1, IFN-αH2, and IFN-α4B. This grouping of type I IFN strongly suggested an IFN-specific pathway of MP polarization in the late phase of their transcriptional response to LPS. Overall, 15 IFNs were tested, 13 IFN-α's, IFN-β and IFN-γ. The IFNs not included among the eight present in the fifth cluster included IFN-γ and IFN-αA, IFN-αG, IFN-αK, IFN-αWA, IFN-αF, IFN-αB2. IFN-αF and IFN-αB2 clustered with the Alternative-like group 1 group, while IFN-αA and IFN-αG with the Alternative-like group 2. IFN-αK, IFN-αWA, and IFN-γ clustered with the classical cytokines. Interestingly, the global transcript profile of the 8 type I signature IFNs was opposite for a large number of genes to that of classical-like cytokines which included TNF-α suggesting that, indeed, type I IFNs represent a distinct biological vector of MP maturation. Two functional signatures appeared to be particularly restricted to signature IFNs. These two signatures included 52 cDNA clones representing 51 genes. In one signature 19 clones represented 18 genes and in the other and 33 clones represented 33 genes. Forty four of the 51 signature genes were unique. Duplicate copies of 7 genes were among 51 genes. These 44 genes characterized the unique transcriptional profile of type I IFN polarized MPs (Figure 2). All 44 signature genes were previously known to be associated with IFN function [16–49] (Table 1). Among them were included myxovirus resistance (Mx)-1, Mx-2, interferon-induced hepatitis C-associated microtubular aggregation protein, 2',5'-oligoadenylate synthetase 1 (OAS1), OAS2, and OAS3, vipirin (CIG5), IFN regulatory factor 7 (IRF-7), and lymphocyte antigen 6 complex (LY6E), Interferon stimulated gene (ISG20), Interferon responsive protein (IFRG28), Interferon induced transmembrane protein 3 (I-8D) (IFITM3), Interferon induced protein with tetratricopeptide 1 (IFIT1), Interferon induced protein with tetratricopeptide 2 (IFIT2), Interferon-alpha inducible protein (GIP2), Interferon-alpha inducible protein (GIP3), Protein kinase, interferon-inducible double stranded RNA activated protein kinase (PRKR), and Signal transducer and activator of transcription 1 (STAT1). Seven of these genes were duplicated in the array, nuclear body protein (SP110), OAS1, OAS3, ISG20, ubiquitin conjugated enzyme E2L6 (UBE2LB), PA28 proteasome subunit (PSME2), and IFIT2, and both copies of the seven genes were among the 52 cDNA clones. It is important to note that the non-signature IFNs demonstrated nearly identical expression of these genes while none of the other cytokine studied expressed them; underlining the selectivity of this expression pattern to type I IFNs with some overlap with IFN-γ. The genes overexpressed by LPS-stimulated MPs treated by 8 type I IFNs. Unsupervised hierarchical clustering was applied to LPS-stimulated CD14+ MP treated for 9 hours with 42 individual cytokines. FN-β and seven αFNs were clustered into a separate group, the signature IFNs. These IFNs were characterized by the marked overexpression of two groups of genes shown. The genes were overexpressed by the eight IFNs and were identified by visual inspection. The analysis was preformed on the same 2063 genes used in figure 1.
protease serine, Could regulate proteolytic events associated with testicular germ cell maturation. Clustering of all 15 IFNs among the 54 genes overexpressed by LPS-stimulated MP treated with the eight signature IFNs. Hierarchical clustering was applied to LPS-stimulated CD14+ MP treated for 9 hours with 42 individual cytokines. The analysis was limited to the 52 genes overexpressed by signature IFNs. To determine the genes responsible for the differentiation between signature and non-signature IFNs, we identified genes statistically differentially expressed between the two groups. 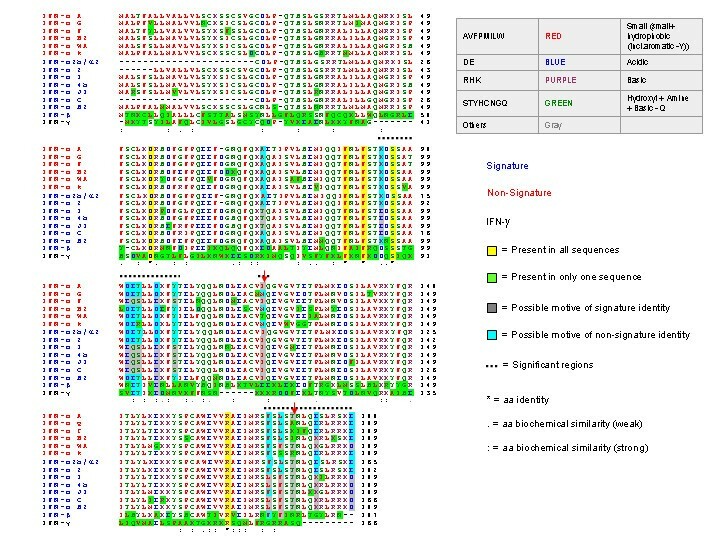 The expression of 83 genes differed significantly between the signature and non-signature IFNs (unpaired t test p2-value < 0.05) (Figure 4). The signature IFNs remained in a single group, but this group also included IFN-αWA and IFN-αK. The expression of a specific set of genes in the node spanning from the CD164 antigen to protein-kinase, interferon-inducible repressor (PRKRIR) resulted in the grouping of IFN-αWA and IFN-αK with the signature IFNs. Selection and clustering of genes differently expressed among LPS-stimulated MPs treated with the signature IFNs and non-signature IFNs. Unsupervised hierarchical clustering was applied to LPS-stimulated CD14+ MP treated for 9 hours with the IFNs. The analysis was restricted to genes that were differentially expressed between the signature and non-signature INFs (p < 0.05), but the 52 genes markedly overexpressed by LPS-stimulated MPs treated with the signature IFNs were excluded from the analysis. The signature IFNs are shown in blue and the non-signature IFNs are shown in red. By using a data base for annotation visualization and integrated discovery http://david.niaid.nih.gov/david/upload.asp, genes differentially expressed between signature-and non-signature-IFNs were categorized according to specific cellular and molecular functions. Sixteen functional groups each containing at least 3 representative genes belonging to a particular biological process were selected: 1) Metabolism/protein metabolism; 2) Catalytic activity/ hydrolase activity; 3) Cell proliferation; 4) Cell growth and maintanance; 5) Cell cycle; 6) Regulation of transcription; 7) Nuclear binding; 8) Nucleobase/ nucleoside and nucleic acid metabolism; 9) Signal transducer activity; 10) Immune response/defence; 11) Cell adhesion; 12) Development; 13) biosynthesis/regulation of translation; 14) Cytoskeleton 15) Transport 16) Cell death (Table 2, also refer to this table for details on gene name abbreviations and single gene function). Signature IFNs upregulated all the genes classified in 7 out of 16 categories: 5) Cell cycle, 6) Regulation of transcription, 7) Nuclear binding, 8) Nucleobase/ nucleoside and nucleic acid metabolism, 9 Signal transducer activity (except for one gene), 14) Cytoskeleton, and 15) Transport. These results indicate that not only are signature IFNs capable of affecting simultaneously a variety of vital cellular functions in MPs but these IFNs are powerful inducer of gene transcription and key regulators of cellular responses to diverse types of stimuli. Both the signature and non-signature IFNs upregulated MP genes in 7 categories 1) Metabolism/protein metabolism; 2) Catalytic activity/hydrolase activity 3) Cell proliferation, 4) Cell growth and maintenance 10) Immune response/defense, 11) Cell adhesion, and 13) Biosynthesis/regulation of translation. Twenty four genes were classified into the 1) Metabolism/protein metabolism, the functional category that contained the greatest number of genes. The large majority of metabolic genes belonged to vital pathways of cell survival. Activation of metabolic genes by the signature and non-signature IFNs affected distinct and yet equally important groups of genes. Seventeen metabolic genes were upregulated by signature-IFNs and these 17 genes affected major metabolic pathways such as MAP/ERK/MAPKK pathway (ZAK), glycolysis/glucose metabolism (GAPD), NADPH dehydrogenase/ oxidoreductase activity (NQO1), ubiquitin dependent protein catabolism/ proteasome endopeptidase activity (PSMA7, PSMA3), lipid metabolism (FABP5), endocytic machinery of cell trafficking (CD63) and nuclear DNA binding related to cell differentiation and proliferation (TAL1, DIS155E). Seven out of 24 metabolic genes were upregulated by non-signature-IFNs and were primarily related to enzymatic activities in protein biosynthesis (LAMR1), proteolysis and peptidolysis (MALT1), lipid catabolism(LIPA) and cytolysis (LYZ). The functional categories 10) Immune genes and 11) Cell adhesion are of particular significance because they may be the basis of the selective immune-polarization of MPs induced by the different IFNs. In particular, immune genes such, IL-6, chemokine receptor 1 (CCR1), chemokine ligand 1 (CCL1) , CD2BP2 and chemokine ligand 3-like 1 (CCL3L1), were specifically expressed by the signature IFNs. CCR1 encodes a member of the beta chemokine receptor family, that binds macrophage inflammatory protein 1 alpha (MIP-1 alpha), regulated on activation normal T expressed and secreted protein (RANTES), monocyte chemoattractant protein 3 (MCP-3), and myeloid progenitor inhibitory factor-1 (MPIF-1). CCRI is a critical receptor for the recruitment of effector immune cells to the site of inflammation [10, 51, 52 Cell Migration Consortium http://wrpx00.bioch.virginia.edu/cellmig_test/cmcweb/resource/cmckb/sci_molecules_list.html] CCL3L1 binds to several chemokine receptors including chemokine binding protein 2 and chemokine (C-C motif) receptor 5 (CCR5). CCR5 is a co-receptor for HIV, and binding of CCL3L1 to CCR5 inhibits HIV entry [52, 53]. Thus regulation of CCL3L1 by signature-IFNs may represent a selective mechanism of viral immunity. The activation of transcription of CCL1 and CD2BP2 in MPs by signature IFNs is an interesting finding considering that these two genes are normally activated in T cells. CCL1/ inflammatory cytokine I-309 is normally released by activated T cells during inflammation , and the CD2BP2 adaptor binds the CD2 cytoplasmic tail and regulates interleukin-2 production . The modulation of CCL3L1, CCR1, CCL1, CD2BP2 by the signature-IFNs confirms the dominant role of these factors in the first phase of the innate immune response, inflammation, viral defense, and regulation of inflammatory cytokines such as IL-2. 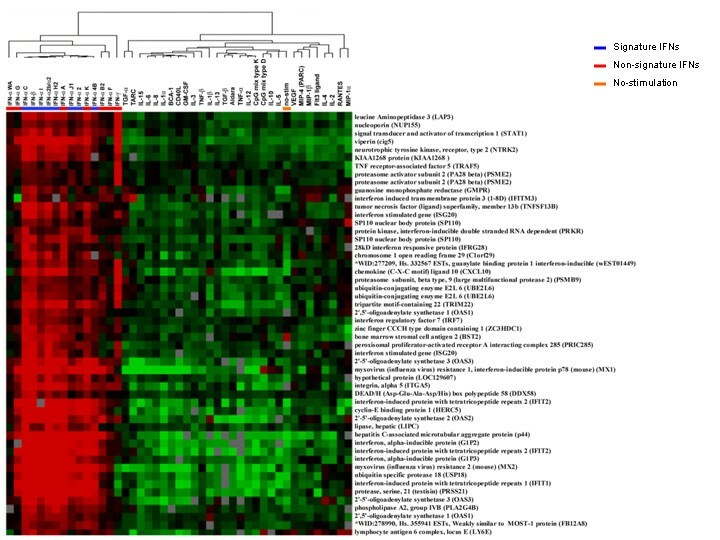 Macrophage expressed gene 1 (MPEG1) [55, 56] (NKG7) , NKTR , MALT-1, LYZ AND CD164 were upregulated by the non-signature group suggesting that these genes with potential cytotoxic and inflammatory functions may increase the effector function of MPs. It is important to notice that IFN-αWA and IFN-αK behaved as the non-signature IFNs regarding activation of immune genes (NKTR, CD164 and MPEG) and thus did not cluster with the signature IFNs (Figure 4). These two IFN alphas may contribute to a special type of MP polarization which may be leading to an intermediate phase of activation in between alternative and classical pathways. The non-signature IFNs also induced the expression of genes involved with cell adhesion and complement regulation: LAMR1 , ICAM3 , CD164  and complement component 1 receptor subcomponent (C1R)  providing further evidence that IFNs belonging to the non-signature-like group may polarize MPs towards the classical pathway of monocyte activation. Signature IFNs specifically affected a group of genes involved in eukaryotic translation and listed in category 13) biosynthesis/regulation of translation: eukaryotic translation initiation factor 5A (EIF5A) , eukaryotic translation elongation factor 1 delta (EEF1D) , and eukaryotic translation elongation factor 2 (EEF2) . This supports the notion that the powerful stimulus of activation induced by the signature IFNs on immune cells is a global type of regulation directly affecting target molecules at the levels of both transcription and translation. Genes upregulated by signature IFNs and belonging to more than one functional group were particularly interesting because they could represent central and shared molecular and cellular switches in pathways not previously reported to be influenced by the signature-IFNs' activity. The ZAK (sterile alpha motif and leucine zipper containing kinase AZK) gene appeared to be a very dominant signature IFNs gene since it was shared by 9 out of 16 functional groups analyzed. ZAK encodes a mixed lineage kinase with a leucine zipper and a sterile alpha motif. The expression of ZAK in mammalian cells may lead to the activation of the JNK/SAPK (MAP kinase family) pathway as well as the activation of the transcription factor, NF-kappaB. Furthermore over-expression of ZAK leads to apoptosis in tumor cell lines . To determine whether a correlation existed between closeness of the primary amino acid sequence of type I IFNs and functional similarities we compared the sequence relationship among the 13 αIFNs and IFN-β. The phylogenic analysis did not predict the differentiation between signature and non-signature IFNs and, in fact, the signature IFNs included proteins phylogenically quite unrelated ( IFN-αWA, IFN-αF and IFN-αB2 Figure 5). Therefore, more limited domains of the structure of each IFN may be responsible for their different functional properties. 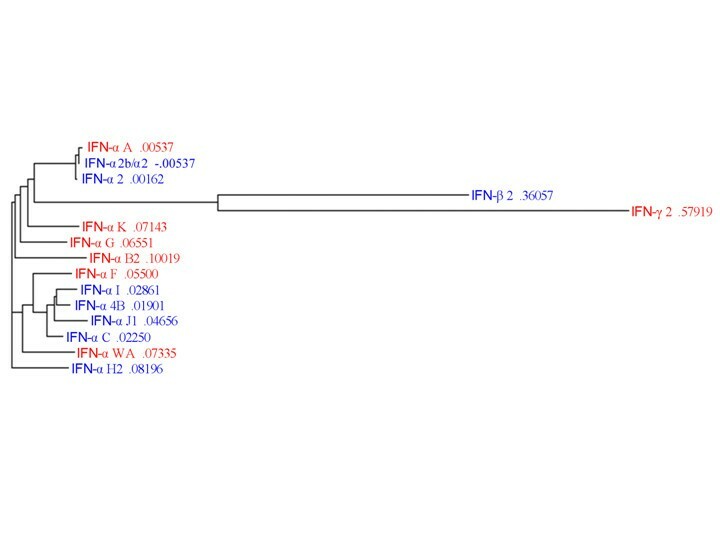 Comparison of the primary amino acid sequences of IFN-β and the 13 αIFNs identified several similarities (Figure 6). Although there was no exclusive sequence variation that could distinguish signature from non-signature IFNs, some amino acids were more likely present in one or the other group. Three regions appeared to be most significant in distinguishing the subgroups of the protein and included: residues 93 through 109, residues 174 through 188-9, and at residue 123. The differences were greatest at residues 123 and 179 where signature IFNs (except IFN-β) had the same amino acid (I at 124 and T at 179, red arrows, figure 6), but these amino acids were present in only 2 of 6 non-signature αIFNs. Phylogenic comparison of IFNs. A multiple alignment cluster of the amino acid sequences of the 13 αIFNs, βIFN, and γIFN was preformed with Cluster W. The signature IFNs are shown in blue and the non-signature IFNs are shown in red. Comparison of the amino acid sequences of IFN-β and the 13 α-IFNs studied. The signature IFNs are shown in blue and the non-signature IFNs are shown in red. Amino acids that were more likely to be present in signature IFNs are shown in gray and those more likely to be present in non-signature IFNs are shown in torqoise. Amino acids present in IFN-β, y and all 13 αIFNs are shown in yellow. Interferons are important cytokines with antiviral, anti-proliferative, and immune modulatory functions . The IFNs are divided into two classes, type I and type II. The type I IFNs include the α, β, τ and ωIFNs, while IFN-γ is the only type II IFN. It has generally been believed that the various type I IFNs have markedly different biological functions and the immune modulatory effects of type I IFNs vary widely among individual IFNs. IFNs exert many of their effects by modulating MP functions [1, 68]. The stimulation of MPs by cytokines, including IFNs, results in the activation of several different pathways; some of which are common to different stimuli and some that are unique for each stimuli. This study shows that most type I IFNs share some MP activation pathways and functional differences among IFNs are due to additional diversification of their function through other pathways of activation. In particular, the effects of seven IFN-α and IFN-β on LPS-stimulated MPs were remarkably similar. These similarities were not apparent after 4 hours of stimulation and required a longer process of down-stream activation that could be identified in our study at 9 hours. Since we only studied one subject, the transcriptional profile presented in this study may not represent the plethora of biological effects that IFN can induce under in vitro or in vivo conditions because secondary autocrine (in different donors) and paracrine modulation through the cytokine network following a primary stimulation may introduce diverse on and off switches that could override the original signal. Nevertheless, this is an informative analysis on the effects of IFN subtypes on the late stages of LPS stimulation and, therefore, maybe most informative on the way mononuclear phagocytes are polarized by IFNs during their activation and or maturation. A group of 42 signature genes was upregulated by all the tested IFNs. Furthermore, all 42 signature genes have previously been found to be associated with IFNs (Table 1). The analysis of a group of 83 genes that were differentially expressed among the signature and non-signature IFNs found that the signature IFNs affected a variety of cell functions not only by being potent inducers of gene transcription and translation but by directly and indirectly affecting crucial regulatory cell cycle and metabolic pathways. In addition, signature IFNs were found to be particularly involved in the first phase of the innate immune response, inflammation, and viral defense. In contrast, the non-signature IFNs gene profiling suggested that these immune-modulators can trigger cytotoxic responses and likely increase the effector functions of MPs or classical pathways of monocyte activation. Type I IFNs play an important role in autoimmune disorders. Serum levels of IFN-α are increased in some patients with the autoimmune SLE. The gene expression profiles of peripheral blood MPs is also abnormal in patients with SLE. Analysis of peripheral blood MPs from patients with SLE has found that IFN-inducible genes are upregulated in almost all patients with SLE [2, 3, 67] and the genes upregulated in SLE patients were similar to those upregulated in peripheral blood MPs stimulated in vitro with IFN-α [1–3, 67]. As a result the IFN-inducible genes that are upregulated in SLE have been called IFN signature genes. Many of the IFN-inducible genes up regulated in SLE patients are the same genes we found were upregulated by the treatment of LPS-stimulated MPs with the eight signature IFNs. The genes upregulated both in MPs from patients with SLE and by LPS-stimulated genes treated with the signature IFNs included OAS1, OAS2, LY6E, MX1, CIG5, and hepatitis C-associated microtubular aggregation protein (44 kD) [2, 3, 67]. Hilkens et al studied the effects of three IFNs, the signature IFNs, IFN-α1, IFN-α2, and the non-signature IFN, IFN-αF on the expression of 150 IFN stimulated genes by dendritic cells derived from peripheral blood mononuclear cells and found that the qualitative effects of the three IFNs were similar but there were quantitative differences . The IFN stimulated genes were more highly induced by IFN-α2 and IFN-αF than IFN-α1, but these differences were overcome by increasing the concentration of IFN-αI. There was, however, one exception. The expression of IP-10 was induced by IFN-α2 and IFN-αF, but not by IFN-αI. This supports our finding that the differences in transcriptional profiles of MPs treated by different type I IFNs are due to distinct effects of each of the IFNs rather than differences in the activation of IFN-specific genes. Although increased serum levels of IFN-α and IFN-ω have been found in some patients with SLE , the proportion of patients with detectable IFN in serum is much smaller than the proportion of SLE patients with peripheral blood MPs that display evidence of IFN-stimulation by gene expression profiling . However, since the IFN genes upregulated in MPs from SLE patients were similar to those upregulated by MPs stimulated with IFN-α, most studies have measured IFN-α serum levels in patients with SLE. Our study suggests other type I IFNs in addition to IFN-α could be responsible of the abnormal MP gene expression profiles in patients with SLE. It may be that IFNs other than IFN-α are increased in SLE patients but the ELISA assays used to measure IFN-α may not detect other type I IFNs that could result in a similar MP gene expression profile. One commonly used IFN-α ELISA kit recognizes IFN-αA, IFN-α2, IFN-αA/D, IFN-αD, IFN-αK, and IFN-α4b, but not IFN-β or IFN-γ (BioSource International USA, Inc., Camarillo, CA) another kit recognizes IFN-αA, α2, αA/D, αB2, αC, αD, αG, αH, αI, αJ, αK, αWA, and α4b (PBL laboratories multi species IFN α elisa kit). Type I IFNs belong to a family of homologous helical cytokines. The various αIFNs have approximately 80% amino acid sequence homology and the α and βIFNs have approximately 30% sequence homology . The α and βIFNs, however, all have a similar three-dimensional structure. They are made up of nearly parallel bundles of five α helices. In addition to the shared tertiary structure, the α and βIFNs signal cells through the same receptor complex, the common IFN-α/β receptor (IFNAR). This receptor is made up of two subunits IFNAR1 and IFNAR2. IFNAR2 plays a greater role in binding type I IFNs than IFNAR1. Although IFNAR2 is the major IFN binding component of the receptor, the formation of the tertiary complex of IFNAR2 and IFN with IFNAR1 increases the affinity of IFN to IFNAR2 up to 20-fold. The binding of IFN-α2 to IFNAR1 and IFNAR2 has been extensively investigated [64–68]. IFNAR2 binds to the A helix of IFN-α2 (residues 12–15), the AB loop (residues 26–35), and the E helix (residues 144–153) . The opposite face of IFN-α2, the B and C helices, is involved with interactions with IFNAR1 . Modeling of the interactions of IFNAR2 and IFN-α2 based on multidimensional NMR analysis of these molecules found that IFN-α2 residues R33, D35 and R149 interact with a hydrophilic strip of matching charges in IFNAR2. Other important IFN-α2 residues involved with the binding to IFNAR2 are M16 and A19 of the A helix, L26 and L30 of the AB loop, and A145 and M148 of the E helix. Mutagenesis analysis of IFN-α2 found six residues important in IFNAR2 binding: L30, R33, R144, A145, and M148. The residues we found that differ between the signature and non-signature IFNs are in areas that are not critical to the binding of IFN-α2 to IFNAR2. Our findings suggest that changes in IFN-α2 residues in the carboxy end (residues 174, 177, 178-9, 183 and 189), the D helix (residue 124) and the C helix (residues 94, 101, 102, 103, 106, and 109) may affect the function of α and βIFNs and are be responsible for the functional similarities among the signature IFNs. We speculate that these changes may affect the tertiary structure of type I IFNs and there binding by IFNAR1. MPs demonstrate a biphasic response to cytokine stimulation and 9 hours after IFN treatment LPS-stimulated MPs had a striking gene expression profile. When treated with eight type I IFNs the same group of genes were strongly upregulated. IFNs play a critical role in host defense and the redundant function of these signature IFNs may help insure that there are multiple pathways of activation of potent host antiviral and antitumor responses. Since several different IFNs have similar effects, when clinical or molecular evidence suggest that serum IFN levels are increased, assays that detect a wide range of type I IFNs should be used to measure soluble IFN levels.